Ginkgo (Ginkgo biloba; in Cheenese an Japanese 銀杏, pinyin romanization: yín xìng, Hepburn romanisation: ichō or ginnan), an aa spelt gingko an an aa kent as the maidenhair tree, is a unique species o tree wi na close livin relatives. 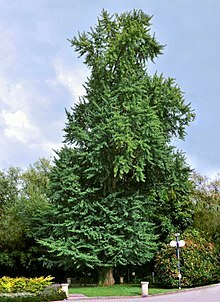 The ginkgo is a livin fossil, recognisably similar tae fossils datin back 270 million years. Native tae Cheenae, the tree is widely cultivatit an wis introduced early tae human history. It haes various uises in tradeetional medicine an as a fuid. ↑ "Gingko". Dictionary.com. Retrieved 28 March 2013. This page wis last eeditit on 2 Januar 2018, at 03:13.